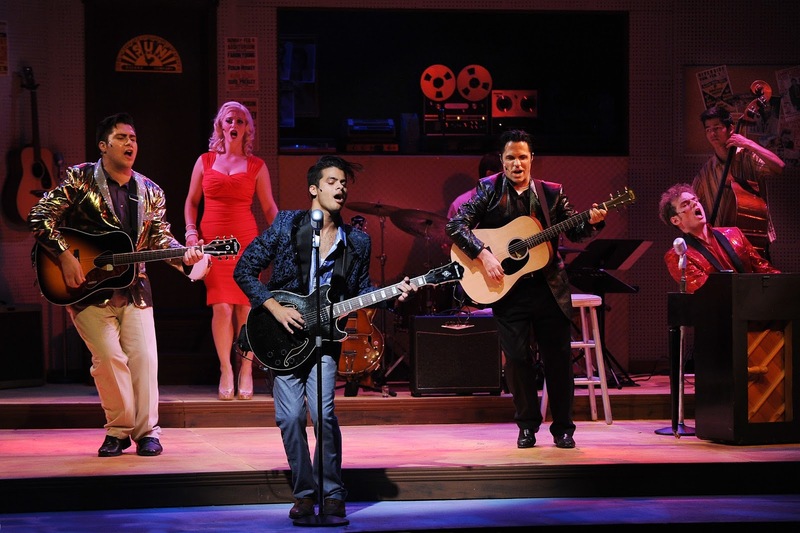 Four of the biggest names in ‘50s music got together on Dec. 4, 1956, and recorded a jam session that became a hit record and now a rollicking musical, “Million Dollar Quartet,” presented by Palo Alto Players. Gathering in the Sun Records recording studio in Memphis, Tenn., Carl Perkins (Tarif Pappu), Johnny Cash (Greg Zema), Jerry Lee Lewis (Nick Kenrick) and Elvis Presley (Jaake Margo) sang and played some of their biggest hits. Director Jeffrey Bracco has assembled this multi-talented cast to regale the audience for about 90 minutes without intermission. And the hits just keep coming. They include “Folsom Prison Blues,” “Memories Are Made of This,” “Down by the Riverside,” “Sixteen Tons,” “Long Tall Sally,” “Peace in the Valley,” “I Walk the Line,” “I Hear You Knocking,” “Hound Dog,” “See You Later Alligator,” “Whole Lotta Shakin’ Goin’ On,” and more. One of the brightest highlights of this evening of highlights is “Fever,” sung by Jessica LaFever as Dyanne, Elvis’ girlfriend. In her form-fitting red dress, she turns the heat up to incendiary pitch. Completing the cast is Jeremy Ryan as Sam Phillips, founder of Sun Records. Daniel Murguia on bass and Ryan Stohs on drums accompany the guitars and piano. Katie Coleman serves as musical director. The book by Colin Escott and Floyd Mutrux is fairly thin, focusing mainly on Sam’s hopes to have all four men under contract to Sun in order to keep them away from rival Columbia Records. There’s also Carl’s animosity toward the brash Jerry Lee. The Southern accents sometimes hinder comprehension of lines, but that’s a minor concern. Music is the centerpiece, and what terrific, uplifting music it is. “Million Dollar Quartet” will continue through Oct. 1 at the Lucie Stern Theater, 1305 Middlefield Road, Palo Alto. For tickets and information, call (650) 329-0891 or visit www.paplayers.org.